The Singing Machine Company is a well known name when it comes to consumer karaoke entertainment systems over in the US, and to make sure that your summer gets all the more interesting if you grew up in a family that belts out tunes and hit songs non-stop with aplomb, then the iSM990BT might be a worthy addition to the bedroom or living room, keeping company the rest of your home entertainment products to boot. 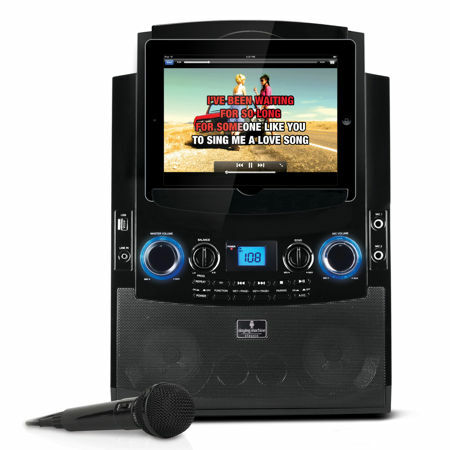 The Singing Machine iSM990BT is a snap to use – all that you need to do is to pair it up with your favorite device, be it a notebook, a smartphone or a tablet, and you can then stream and check out more than 8,000 karaoke songs via The Singing Machine Mobile Karaoke App. Never suffer from an awkward moment of humming particular bits of a song just because you do not know or have forgotten the lyrics, since the lyrics will be displayed on your smartphone or tablet for easy viewing, letting not only you, but the rest of your mates sing along as well. You will be able to select as to whether you want to play your karaoke songs via a CD+G or USB, or to hook up the device to your TV or monitor in order to get a better and clearer look at the lyrics without having to squint your eyes. Apart from that, you can also listen and record from the speakers and microphone while sharing the experience over and over with your friends. The iSM990BT doubles up as a Bluetooth speaker to boot, where it is capable of streaming music from your device or play CDs. Expect the Singing Machine iSM990BT to retail for $129.99 a pop, and just in case it is late at night already and you would still like to sing in your apartment to soothe away the day’s stress, you might want to pair this bad boy up with the Noiseless Karaoke Mute Mic 2.